This dish supposed to be tuna and crab meat casserole because I thought I have some leftover tuna and crab. 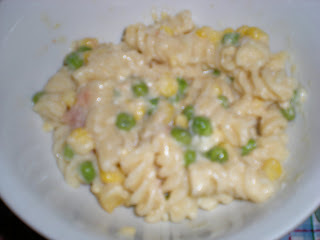 So, it ends up to be a simple pea and corn pasta casserole. 1. In a pasta pot, boil water and add salt and pasta. Cook 2 minutes less as package directed. 3. 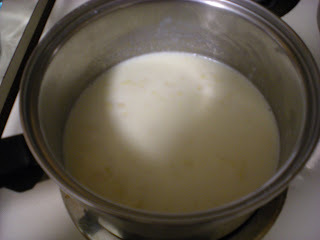 Meanwhile, in a saucepan, add milk and cream until mixture is smooth over low heat, about 5 minutes. 4. 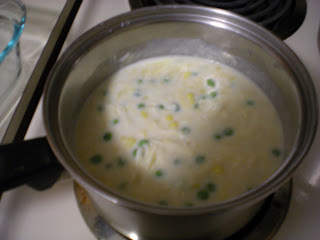 Turn heat off, add peas, corn, 1/2 cup of mozzerela and seasonings. 5. 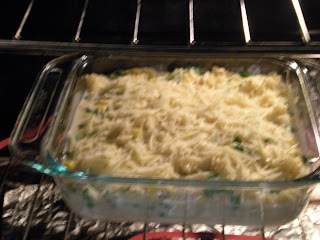 In a casserole pan or 8 x 8 inch baking pan, mix in the pasta and the mixture. Cover it with the remaining of the cheese. Bake for 20-25mins or until golden brown.